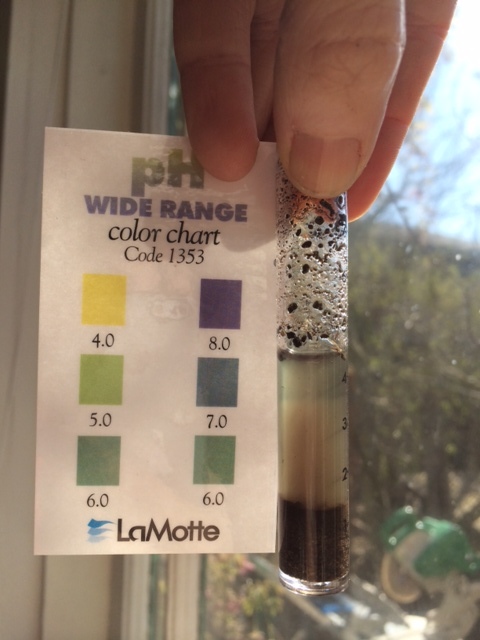 Soil chemistry testing with LaMotte Soil Test Kit! I have tested my soil nutrients and composition before. I made some lame attempt to address deficiencies, adding compostfor depleted nitrogen and fireplace ashes to raise the pH. Results were – meh. THIS year, I vowed, would be different. I would have the patience to get to the bottom of my soil conditions and scientifically address them! 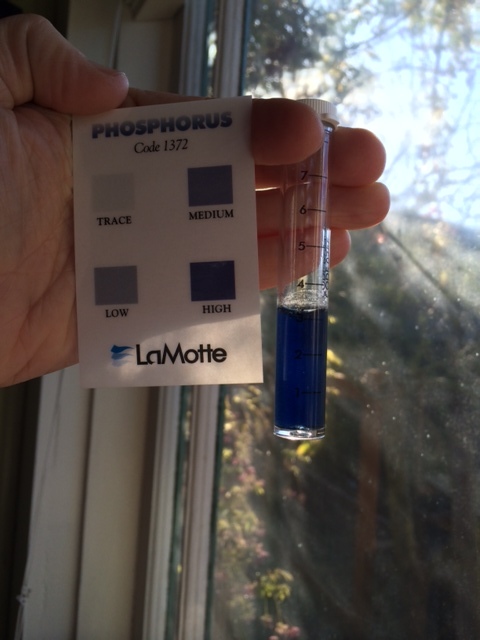 Out comes the Lamotte Soil Test Kit. I love this thing. It reminds me of the chemistry kits I envied but never had as a kid. 1. Take soil sample from a few inches below the surface. Integrating from a few spots throughout the bed is a good idea (whatever). 2. Spread out the soil to dry (I used squares of tin foil so I could save the sample for later), removing rocks and plant debris. Crush clump to speed drying. 3. When soil is dry, crush it through a fine seive. I used my fine metal kitchen colander. 4. I also weighed my samples plus the debris that didn’t make it through the seive to calculate % coarseness. Cause I’m a geek. 5. Perform soil tests. 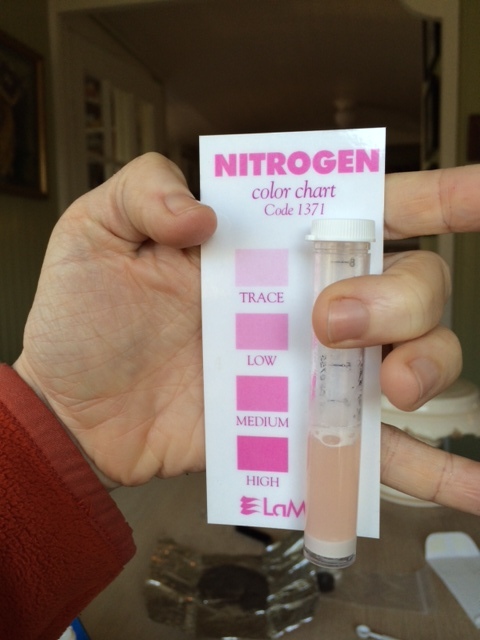 Kit includes testing for pH, N, P, K.
6. 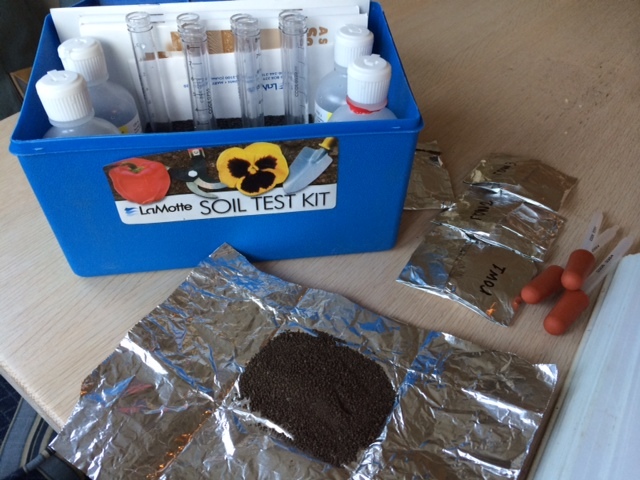 Additionally geek out by performing a soil composition test. All of my untended beds (by this I mean completely ignored all winter with no cover crop or protection) had the same results: pH 7-7.5, Trace N, high P, high K. I expected low pH, so maybe this means last year’s fireplace ash application more than did its job. 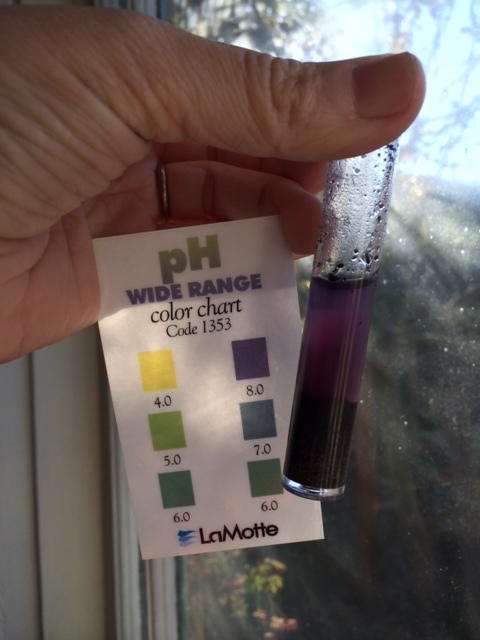 That might also explain the P and K.
The low N seemed extreme and made me wonder if the test was working right. Until I measured my asparagus bed which had – shocking – different results: pH 6.0, High N, moderate P, high K. I had recently top-dressed this bed with 1″ compost, so even though I dug down under that for my soil sample, it would seem compost makes a difference! I will apply 1# of fireplace ashes/sqyd of asparagus bed to bump the pH closer to 7, but they like it a bit on the acid side, so I’m not too worried. What do do about a soil that needs a ton of N, but little else? I have decided on feather meal. It contains about 15% N, works at cool temperatures, and releases N for up to 6 months. 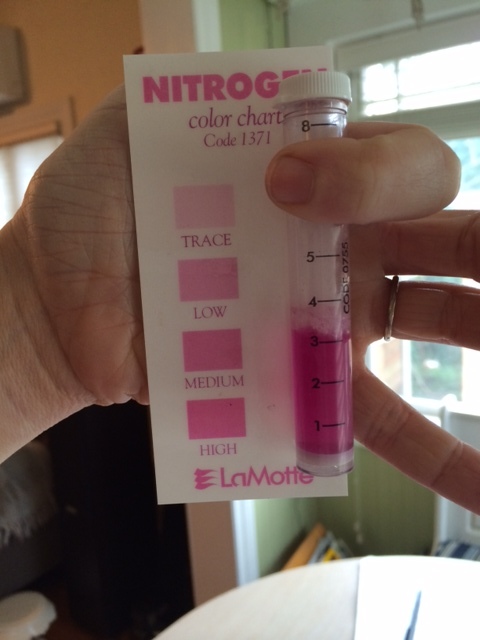 The LaMott guide suggests 10# N/2000 sqft for ‘Low’ N soil result. Other places I read twice that. So I’m going for 0.01#/sqft. For my 275 sqft of veggie beds, I will need 2.75# of N. At 15% N, that means 18# of feather meal. My local(ish) source sells feather meal in 20# bags – Done! Gorgeous, but can you see how there are two colours there? The purplish-blue one at the surface is the right colour (7.5). Below that, the suspended fines are clouding the solution. When I let this settle for several hours, the water column was all 7.5. This was the result for most of my beds – making me question whether the test was working properly. Until I saw the asparagus result. Again, see how the fines interfere with colour interpretation? The blue-green colour (6.60) at the top is correct. Aha! There be nitrogen! This was the recently-compost-ammended asparagus bed. This entry was posted in vegetable garden and tagged asparagus, fertilizer, soil test. Bookmark the permalink. You probably know more than we in this area, but we have heard that nitrogen is very mobile in the soil and difficult to build up for any length of time.